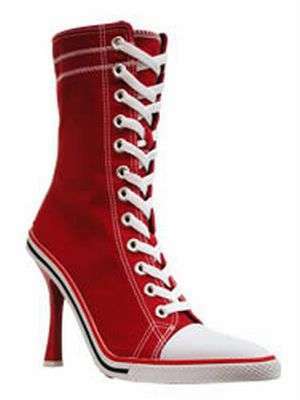 Apparently after all the practice that women have had with stilettos, there are no limits for the height or concept behind these shoes. Would you dare to wear a 16-inch stiletto? Or -- if you're a man -- try some male stilettos on? How about slapping some wings on your stiletto-loving feet and flying off? Either way, these stare-worthy stilettos are hard to take your eyes off of! Implications - From aquatic high heels to freaky shoes for daring soles, stilettos, like many other fashion pieces, are defying conformity and pushing design limits. By doing this, the shoe designers manage to captivate a larger audience and manage to grab free publicity for their daring designs.